Parking really, really matters. It has a special role in the way places work, and getting it wrong can cause all sorts of problems down the road (pun totally intended). Getting the parking right has the power to animate streets, calm traffic, encourage neighbourliness, deter crime, and improve efficiency. It can’t bring about world peace – yet – but it can even help to give people bigger and better gardens (which we have long suspected is the first step on the road to world peace). Parking at the back means big areas at the back for…well…parking. This means less space at the back for gardens, less use of front doors, and access into the interior of the block. In 30 years time you just know that the image below will be full of old mattresses, annoying oiks being annoying, litter, weeds, and broken glass. Not nice and totally unnecessary. Cars on the street act as a natural traffic calming measure, forcing drivers to slow down as the dangers of opening doors and kids running out plays on their minds. It also means you can use your front door, which seems like a good idea as it is normally pretty well placed for, you know, getting in to your house. There is a chance that you will bump in to your neighbours when going to and from your car too, which is (usually) a good thing. Finally, having several thousand pounds worth of shiny ‘ride’ outside in the street makes you more likely to look out of the window if you hear a strange noise as there is the slim chance that someone is taking liberties with your stereo. Who knows? This vigilance might interrupt a crime. You hero. The most efficient forms of parking are unallocated and even unmarked. People are pretty good at getting lots of cars in to small spaces, so where you can you should let people get on with it and spend your time worrying about something else. Of course, this only works if you allow for parking in the first place. Accept it. Don’t fight it. Doing so will only upset you when you visit your development to find people parked wheels up on the pavement whilst your lovely parking court sits empty. If you want to know more then you should read this. Or you could get in touch and we can help. This video is brilliant, isn’t it? The plan: turn off traffic lights, see what happens. The results? Well, watch the video and see what you think. It shows the relationship between patterns of development and fuel use. Unsurprisingly, compact places like Hong Kong have a far lower per capita consumption than places that sprawl, such as cities in the USA. London sits in the ‘sweet spot’, just at the point before exponential growth in consumption takes off. The correlation between car use, fuel consumption and CO2 is pretty clear (although other factors skew it a bit). 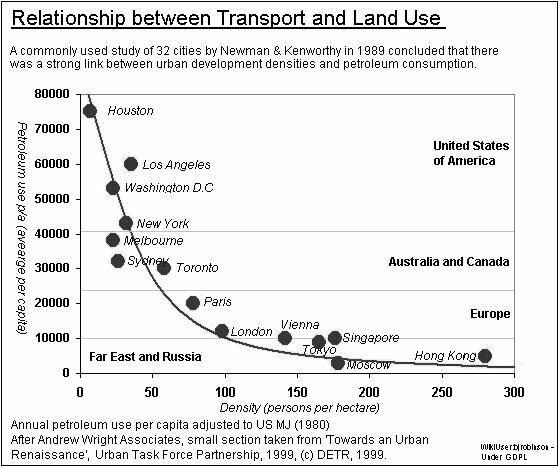 Density has a strong role to play in reducing emissions, and it does this mainly through reducing the need to travel. Yet there is strong resistance to making places more dense. 30 dph seems to be about all people are willing to accept and this is laying the groundwork for all kinds of future issues. Next, lets look at connectivity. Research by Saelen et al (2004) concludes ‘that residents from communities with higher density, greater connectivity, and more land use mix report higher rates of walking/cycling for utilitarian purposes than low-density, poorly connected, and single land use neighborhoods’. There is a wealth of research that shows the importance of the urban environment to health, and it is no surprise that better connected places are more walkable. Connected, populated places offer the best chance of supporting a mix of uses as well as buses and other services, and we need a shift away from fearing density if we are going to deliver sustainable development on the ground. What follows is an attempt to move at a canter through the evidence for why making quality places matters, and no doubt misses out loads of good stuff in the process. If you want to frame the quality places arguments in economic terms, then we highly recommend you read this: http://tinyurl.com/38pyzfd OK, so its main focus is on walking, but it covers health impacts along with other extra costs of designing places that are car dominated. Taken together with the MfS research, you can start to build a pretty good empirical argument as to why producing quality places matters both in the short term to the developer and in the longer term for sustainability and robustness. In it, they use space syntax to analyse layouts for types of crime and conclude that more connected, higher density layouts are safer (OK, so that’s a bit of a leap and you’ll have to read through the limitations of the various study elements to see if that conclusion stands). Use this data when you next talk to a councillor or developer (or estate agent, or potential home buyer…), and explain to them how the fabric of a place can affect their lives. In advance of the official reveal on the 20th of October, the leaked listed in the Telegraph sees the abolition of 177 quangos, in line with the Coalition Governments promise to cut funding to undemocratic governance bodies in all sectors. According to the leaked document, the future of CABE and HCA is still under review. The upcoming Localism Bill seeks to empower communities in the delivery of housing and this shift in emphasis might not be best served at the national level by organizations that are remote from communities, and it is here that ABECs have an opportunity to make a valuable contribution. Local Housing Trusts will have planning and delivery powers for housing and there is a real chance that such bodies can overcome some of the traditional barriers inhibiting the delivery of quality on the ground. To do so they are going to need cognate and truly independent advice, and ABECs have been delivering in this respect for a number of years. However, the network of Centres will have to work together in highlighting where we can add value, and work hard to ensure that the message across centres in consistent and that we are able to deliver. Another possible role for independent centres unburdened by with-profit structures is in service delivery for LEPs and other local partnerships. Budget pressures will see design functions outsourced from planning authorities, but perhaps there is another way. Joint design departments would offer considerable savings, and ABECs are perfectly places to administer and deliver this kind of service without the costly setup funds otherwise required. Hard times are ahead, but the future of the design agenda is far from bleak and we may yet see the fundamental changes needed to really deliver. What’s more, the 3rd sector may be uniquely placed to make it happen. Localism is at the core of the new Governments approach to development and TransForm MKSM are working with Local Authorities in delivering truly sustainable projects that reflect the needs of local communities. The Decentralisation and Localism Bill, announced during the Queens Speech back in May set the tone for future decision making on built environment issues. The abolition of Regional Spatial Strategies was the first big step towards devolving power back to the local level, and Green Paper 14: Open Source Planning seeks to go even further with arguable the biggest change in the field of planning since the Town and Country Planning Act in 1947. How places form and grow over time has historically always been a very local process, arguably less so in recent times as a limited number of development ‘models’ have been adopted and delivered by a decreasing number of volume builders. With a shift in emphasis back the local level, there is a opportunity for development once again to reflect on the place that it occurs, and here the role of the Local Authority will be critical. To help, TransForm MKSM have developed a subscription service that enables Local Authorities to gain expert input and advice on design issues and we are adding new organisations all the time. To find out how we can help you, contact us by phone or email. Here at TransForm we see streets as being one of – if not the – most critical element when putting together a new place or updating an existing one. Streets last. Look around you and the buildings you see will have a short life in comparison to streets. Get the streets wrong and you are stuck with them for a long, long time and the consequences can be dire. Streets influence who can go where, and to some extent how they choose to get there. It is from the street that you experience the rest of the urban environment, and to a degree it is this experience that you take away with you and with which you judge an environment successful or otherwise. Follow the link below to a short video presentation where Sue talks about streets, their importance in delivering quality places, and outlines how to deliver them.